I have a 24TB Areca Raid where I accidentally deleted the “VolumeSet”. I have since recreated it with no initialization. It consisted of a ~488GB NTFS partition and a ~23.48TB Truecrypt encrypted volume. Using R-Studio Demo I can see the files that were on the 488GB partition. 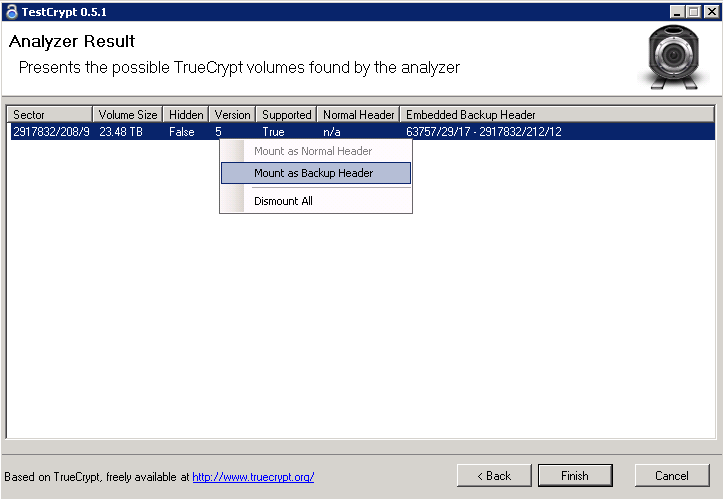 TestCrypt can find the volume and can “Mount as Backup Header”. But this comes up as uninitialized and R-Studio and TestDisk don’t seem to find any files on this volume. Try PhotoRec on the mounted volume. If only junk files are recovered, the volume is probably at a different offset or the encrypted key is wrong. It's looking like just junk files are being found. Is there a way to specify a different offset? Or some way to calculate the partition details?